The Easter weekend is coming up, and this year my birthday is sandwiched between death and resurrection on the Saturday. I shall not be doing any cooking for the whole weekend, which will be novel. While the children run around the garden looking for eggs on Sunday, weather permitting, I shall be opening my parent’s fridge and raiding their cupboards like a student back from Uni. This recipe has nothing to do with dough, but more to do with sugar, chocolate and nuts. While I’ve bought various eggs for various offspring, I also decided to make a little side treat of chocolate brittle for the adults. For some reason, we had a mountain of nuts and chocolate in the cupboard and using it for this weekend seemed apposite. If you can avoid burning the first lot of caramel so much the better. I’d recommend not leaving its side until it’s ready. For example to wander off and read the sleeve notes on ‘Sing it Again Rod’. You’ll have to work quickly when the caramel is ready and be careful to not burn yourself. Hot caramel is a new kind of pain. You can use peanuts, almonds, pine nuts, pistachios and add salt, chilli, vanilla essence and all kind of things to add variety. This one is a simple salted caramel version. You can also use less dark chocolate and replace it with milk chocolate if you prefer. The children are keen to each have one of these smashed over their Viennetta for pudding this evening, I think that is a cracking idea. Prepare a large sheet of baking paper on the kitchen worktop and give it a quick spray of cooking oil to help stop the caramel nuts from sticking. Slowly melt the sugar with a pinch of salt in a heavy-based pan, one large enough to fit the chopped nuts in when the sugar has melted. Copper pans are the best for this if you have one. Shake the pan every now and then as the sugar melts, be careful to not let it get too dark and burn. This is horrible and bitter, like Ukip crossed with Heather Mills. When it’s melted and a lovely dark caramel colour, quickly pour in the nuts and stir well on the heat until they’re all coated. Pour the mix out onto the prepared paper, shape into a rectangle with a metal palette knife and leave to cool. Melt the chocolate for one minute and 20 seconds in the microwave (you could do it the traditional way in a bowl over simmering water if you prefer, but really?). The chocolate should still look as though it’s mostly kept its shape. Beat it with a small whisk and throw in the chocolate drops. Keep stirring until they melt and the chocolate is smooth and shiny. 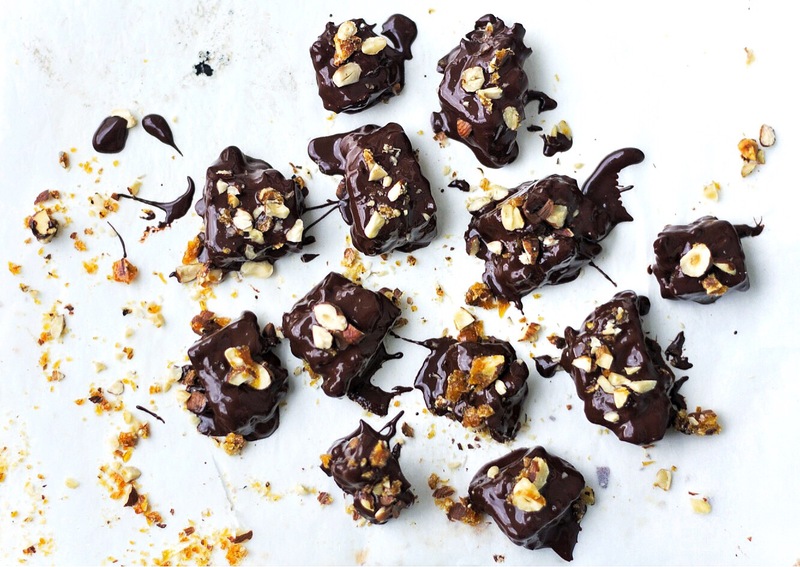 Cut the nut brittle into small rectangles or squares and dip each one in the melted chocolate. Sprinkle with some of the fallen off nuts and caramel if you like and leave to set. You can wrap these individually in paper or store in an airtight container until ready to eat/dish out. It’s not Easter, but I’m going to make this!! !